Global Sustainability Project students from Gahr High School, 2016-17, had their 30 page research findings accepted for publication by the scholarly journal, The International Journal of Innovation & Scholarly Research 2018. The students assisted the California Department of Fish and Wildlife by identifying and monitoring invasive species such as zebra mussels, quagga mussels, mud snails, fish, and turtles in the lakes at Cerritos Regional Park and Heritage Park in Cerritos, California. They also evaluated the effectiveness of a public education strategy designed to reduce invasive species and improve the water quality of Cerritos Regional Park. 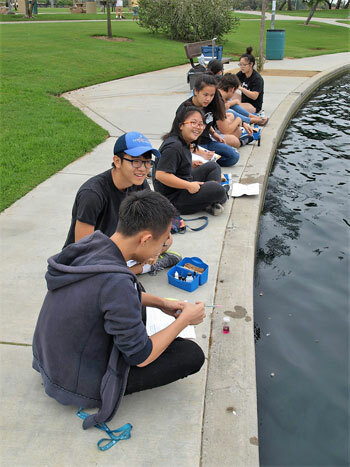 The students conducted regular water quality experiments in Cerritos Regional Park Lake to check the pH, temperature, nitrate, phosphate, dissolved oxygen, calcium, carbon dioxide, and silica and collected and identified the type and number of invasive plankton over time.